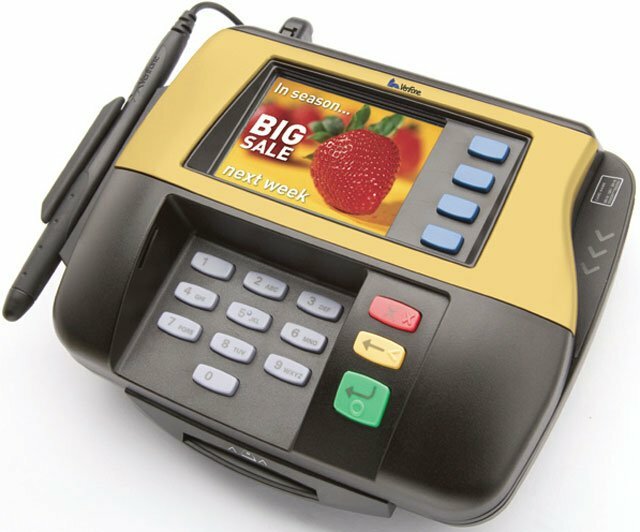 Designed for demanding multi-lane environments, the MX850 has a powerful payment processing engine, a convenient keypad for secure PIN entry, an ultra-crisp color display, and outstanding durability making it the clear choice for retailers. The PCI PED approved MX850 securely handles transactions in seconds, while also delivering a dazzling array of brand reinforcement, cross-promotional messages and even consumer disclosures directly to consumers. With its scratch-resistant touch screen, non-mechanical stylus, customizable trim plate and laser-etched keypad, the MX850 is built to last for years. Field replaceable modules, expansion slots, and a USB port further future-proof the MX850 and allow the addition of contactless and smart card payment or other capabilities as new technologies emerge. M090-209-01R	 MX850, Smart Card, signature capture touchscreen. Requires key injection in order to accept debit or credit card payments. Please call for more information. The VeriFone M090-209-01R is also known as M090-209-01R	or M09020901R	.